Lost Coast Press, 9781935448044, 243pp. 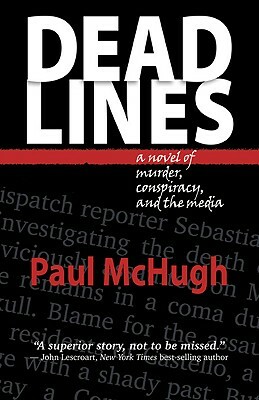 "Deadlines" launches into action when a land-use activist, Beverly Bancroft, is slain on a stretch of California shore. The killers, who disguise her death as an accident, work for Cornu Point, an equestrian resort seeking to boost profit from public land along the coast. A young reporter, Sebastian Palmer, finds Bancroft's death could be a clever murder. He's assisted by a new friend, Elle Jatob, a beautiful, athletic Brazilian who yearns to be a cop. Palmer's newspaper assigns veteran columnist Colm MacCay to Palmer as mentor. MacCay, a wild alcoholic, fails to perform. Palmer soon becomes the next victim. MacCay convinces Jatob he can revive his investigative skills. She helps him uncover the land-grab that prompted attacks on Bancroft and Palmer. "Deadlines" ends on the old Bancroft estate. MacCay and Jatob must face a determined killer and a lawman who might not be on their side. Their lives are at stake, as well as fate of lands on the California coast.